A digital image by Angelica Rojas Gracia prepared for the Visions and Pathways 200 project. It shows a bicycle highway built above train lines at North Melbourne station. As the conversation turns to the death of Melbourne’s trees the city’s influential head planner, Professor Rob Adams, chokes up. He takes a moment, then continues. Adams is talking about climate change. And despite its wealth and culture Melbourne’s city heart is not immune to its impacts. Nor is its contribution to the problem insignificant. In response Melbourne City Council has set perhaps the most ambitious climate change goal in Australia – to produce zero net emissions from the CBD and surrounding suburbs under its oversight by 2020. Needless to say it is a level of ambition not matched by state and federal governments. In fact Adams – credited with revitalising the CBD over recent decades – is upset about what he describes as the federal government’s retreat on the issue. “Why don’t I get depressed, when I look at my little grand daughter who is eight months old?” he says. Without intervention 27 per cent of Melbourne city trees are expected to be lost in 10 years due to heat, disease and old age. But they are not the only element of city life threatened by a warming planet. Council research on the impact of January’s record-breaking heatwave – which scientists project will occur more frequently as climate change worsens – found city retailers lost $37 million over four days as shoppers stayed out of the 40-plus degree heat. Last year flood modelling, based on end of century sea-level rise of 0.8 metres, found average annual inundation bills in Southbank could alone rise from $3 million in 2011 to $20 million by 2100 if prevention is not taken. With high stakes and high ambition city council this year updated its plan for the zero emissions goal. It is a document of many concrete measures, plenty of promises and the occasional motherhood statement. An implementation plan is due later this year. Chair of Melbourne’s environment portfolio, Cr Arron Wood, says one option to meet the target would see Melbourne switch to 50 per cent renewable energy. Most of that power would be fed into the city from large solar and wind farms located in regional Victoria, he says. About 1500 megawatts of renewable energy would have to be generated, enough for 480,000 average homes. To do this it would take 15 massive solar plants of the type currently being built on 250 hectares of farming land near Nyngan in regional NSW. It is Cr Wood’s goal to eventually have some of the city’s biggest energy users – hospitals, universities and sporting precincts – directly powered by renewable energy farms located far beyond the city edge. A much smaller amount of energy, enough to power 10,000 houses, could be generated from solar panels on warehouses and commercial buildings inside the municipality of Melbourne. They are big dreams. But city council is limited in budget and reach. Its zero emissions strategy freely concedes a radical shift in energy generation is subject to federal and state government policy. And ultimately most city power still comes from burning highly emitting brown coal. Two years ago the Melbourne City Council became a certified carbon neutral organisation. But its goal to achieve the same for a capital-city municipality with a daytime population of about 850,000 people was never going to be as comfortably achieved. Its updated zero emissions plan identifies areas in which inroads can be made. There are large emissions cuts on offer in making commercial and residential buildings more energy efficient and turning waste into energy, among other things. Already there are council programs in place to help businesses in commercial offices, and apartment owners and tenants, cut their energy consumption. There is also the urban forest strategy [mentioned by Professor Adams above] to increase tree canopy cover from 22 per cent to 40 per cent by 2040. But the council’s signature policy to cut commercial building emissions – 1200 buildings – has been slow to take off. Only 57 buildings have signed up so far, less than 5 per cent of its goal. Instead, council measures the program’s success on a survey finding an estimated 500 other buildings have undergone a retrofit outside the program since 2008. And before cutting emissions, the city still has to stop their growth. City emissions were almost six million tonnes of carbon dioxide equivalent in 2012-13, rising from about five million tonnes the year before. Without action they are forecast to grow to 7.7 million tonnes by 2020. The emissions savings identified for the council would cut about two million tonnes a year, enough only to curb the forecast emissions growth. To achieve zero net emissions by 2020 carbon offset credits will have to be bought. Cr Wood says he hopes only 10 per cent of the target will come via offsets, but concedes they will probably have to be used for areas of the economy extremely difficult to decarbonise. Ben Smith, associate director of sustainability at consultancy AECOM, says another issue is that zero carbon goal only applies to the City of Melbourne, whose direct reach stops not far beyond the CBD. “While many other local councils in Melbourne have their own ambitious climate plans … a co-ordinated climate action plan for the entire Melbourne metropolitan area could maximise community and economic benefits while minimising costs,” Mr Smith says. Professor John Wiseman, deputy director of the Melbourne Sustainable Society Institute, agrees. He says city emissions from transport, energy and food production are intrinsically linked to the suburbs and wider Victoria. “It does not make sense to think about the city without thinking of Melbourne”s urban area as a whole, and then the state as whole. There are a bunch of interconnections there that are important,” he says. Wiseman is co-authoring a chapter for the forthcoming book Melbourne What Next with senior climate scientist at the University of Melbourne, Professor David Karoly. It looks at how climate change will affect the city. He says it opens with observational data showing just how fast Melbourne is warming. The number of days in the past decade above 35 degrees was 12 per year, well above the average of nine days per year in the 1990s. And Melbourne is now one degree hotter than in the 1990s. These increases are already higher than the CSIRO projected changes for 2030, indicating that Melbourne’s climate is warming faster than expected. Professor Wiseman says their chapter also includes a “rough sketch” of how zero net emissions might be achieved across all of Melbourne by 2020 without offsets. First would be a clear statement from the premier, lord mayor, and as many other local council mayors as possible, that their highest priority is a zero carbon economy. Then climate change laws would be passed in state Parliament enshrining the target. From there myriad programs and plans would be implemented. One for 100 per cent renewable energy in 10 years. Another to electrify freight and passenger transport in the city, such as replacing fossil fuel cars with electric ones. Others for saving power right across the city – retrofitting existing buildings, expanding energy efficient industrial equipment in manufacturing and agriculture. And plenty more. “But it would be hard to imagine anything like this without a national carbon price,” Professor Wiseman says. For instance he compares the city council’s work favourably to the muted discussion of climate change in the Napthine government’s broader planning strategy, Plan Melbourne. Elsewhere a team of researchers from three universities and CSIRO is planning low carbon cities in more detail. Professor Chris Ryan from Melbourne University’s Victorian Eco-Innovation Lab says the group is preparing detailed roadmaps for four Australian cities – Melbourne, Sydney, Perth and Adelaide – to slash their emissions by 80 per cent by 2040 and build resilience against increasing extreme weather. Professor Ryan says the group is not assuming the development of radical new technology. Instead it is analysing existing systems of city energy and transport to see whether they can be reconfigured to operate in entirely new ways. He says what has emerged through initial discussions with industry and government is a common theme of “disruptive changes”, such as renewable energy technologies and a more distributed and less centralised city, taking hold. People would travel less, with work, services and recreation brought closer to where they live. That would better suit low carbon transport – cycling, walking, electric vehicles, and small self-drive cars. Public transport would satisfy medium distant trips, and high speed rail for long distances. There would be a shift away from private space towards more shared public space. And the project will look at what role sharing services might play. Another idea floated is repurposing underground areas as public space for times of extreme heat. If Melbourne decreased its dependency on cars could the Burnley or Domain tunnels become an underground garden or market? From these initial steps – they are just four months into a four-year project – the team has begun preparing what he calls “glimpses” – evocative digital illustrations – of what a low carbon Melbourne could look like. 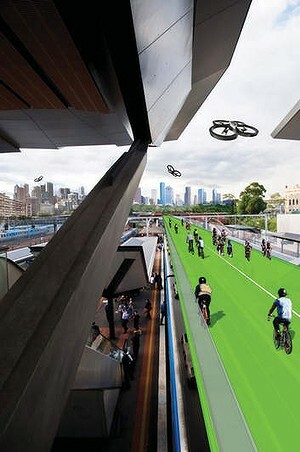 One, released early to The Saturday Age, shows a “bicycle superhighway” running past North Melbourne station towards the city, built above the train lines. “The need for the transformation of cities is that we literally embedded our very dependency on fossil fuels in the very fabric and morphology of the city,” Professor Ryan says. While there are many limitations with what a city can do on climate change, they also have advantages. Smith says with 75 per cent of the world’s population forecast to live in metropolitan areas by 2050, cities are the place most people identify with. Local governments can build traction on the back of that identity, and they are able to work closely with the businesses operating in their boundaries. Professor Adams says talking about climate change in the context of a city localises the problems and solutions. “Suddenly as a citizen I can engage with that. I can reduce my water, I can save energy. I can do the things I need to do,” he says. He acknowledges the zero net emissions target is ambitious. But for Professor Adams there is value even in just setting an ambitious goal. Tom Arup is Environment Editor. Aisha Dow is City Reporter.